During a rather uneventful rush-hour on Friday, I ventured out to Eastgate and tried out Metro’s new ride-hailing service, “Ride2”, which is operated by Ford subsidiary Chariot. Service is available during weekday rush hours, from 6 to 10 a.m. and 4 to 8 p.m., and is booked using a smartphone app. Installing and setting up the app was straightforward, only requiring a name, e-mail address, phone number, and password. There’s also an option to add your ORCA card to improve service (though it isn’t spelled out what the card data is used for) and another screen has an option to mark yourself as a person needing mobility assistance (which would book a wheelchair-ready van). There is also a dedicated phone number for riders without access to the app, which promises full functionality that is equal to the app version. The app works for any trip originating from or heading to Eastgate Park-and-Ride, which has a dedicated drop-off area on the northeast side of the bus bays. The map screen lets you input an address or scroll around to drop a pin within the highlighted service area, which covers Factoria, Somerset, and Lake Hills. Once a trip is requested, it can be summoned as soon as possible or scheduled for a later time within the next 24 hours. The app sends an estimated pick-up time as soon as a trip is confirmed and then notifies when the shuttle has arrived, giving you two minutes to board the correctly-numbered van. I called for a shuttle while on the walk from the freeway median stop above the park-and-ride and had a shuttle waiting for me as soon as I was able to make the five-minute walk down to the designated pick-up area. The driver asked for my name and unlocked the side door, which rolls out with a little difficulty. The standard van has thirteen seats that weren’t particularly comfortable and a layout that would feel cramped with a full load of commuters; luckily, I was the only one on my requested trip to the Lake Hills Library, about 2.5 miles from the transit center. The trip itself took about 15 minutes in moderate traffic, and I managed to save a few minutes that would have been spent on the slower Route 226 bus that meanders through the Bellevue College campus. Like other ride-share systems, the driver’s route is controlled through a mounted tablet, but it didn’t interfere with his driving and, according to him, was fairly lenient when it comes to where passengers can be safely dropped off. After your trip is completed, the app will send you an optional survey that takes a minute to fill out. Requesting a return trip would have taken too long for me (though it would’ve been better to prepare a ride in advance using the scheduling feature), so I opted to ride one of Metro’s new Gillig buses that was on an Eastgate-bound trip on Route 226. Overall, the service was speedy, easy to use, and much more convenient than some of the more unwieldy bus routes in the area. For the time being, the service has no fares, but Metro plans to charge the standard bus fare after the end of the pilot program using on-board ORCA card readers. With prices basically being free for transferring bus riders, I could see the Ride2 system being fairly popular and worth expanding into other underserved markets, particularly in the suburbs. 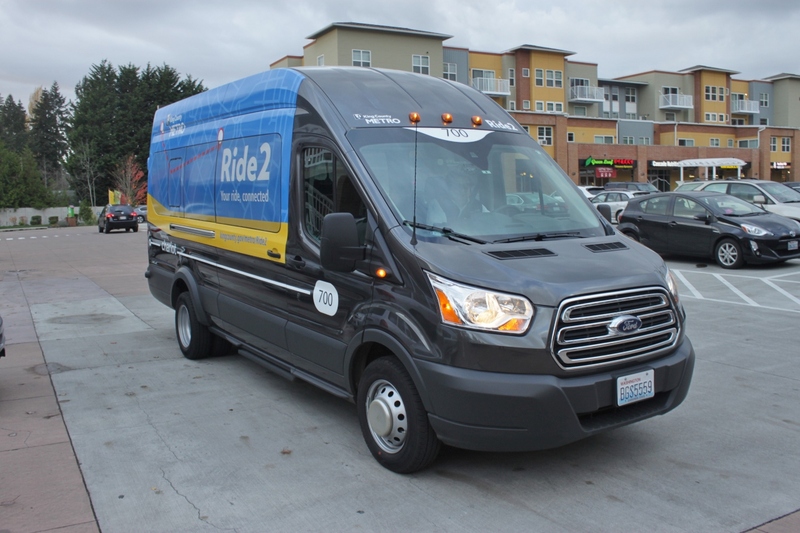 Earlier in the day, I attempted to use two older forms of “microtransit” in Issaquah: the freebie shuttle that runs every 30 minutes around town, and the flexible service on a community route in the Highlands. While the shuttle was easy enough to use, being a regular bus, requesting a shuttle diversion by phone was cumbersome and tiring, with several holds and no clear information. The Issaquah Highlands would be an excellent place to deploy Ride2 shuttles to complement or replace the existing shuttles, even if it remained time-restricted. Man, I wish my ride was free. Did you give the driver 5 stars? A couple things to add. When I’ve ridden them, the shuttles often carry less than 3 people, the majority of my rides I’ve been the only passenger. Also, a good bit of the neighborhoods around Eastgate are hilly, while this seems trivial, the large and heavy doors are not power assisted. I’ve got 2 suggestions for this service: Downsize to the Transit Connect vans, as the capacity of the larger Transit Vans just isn’t needed here. 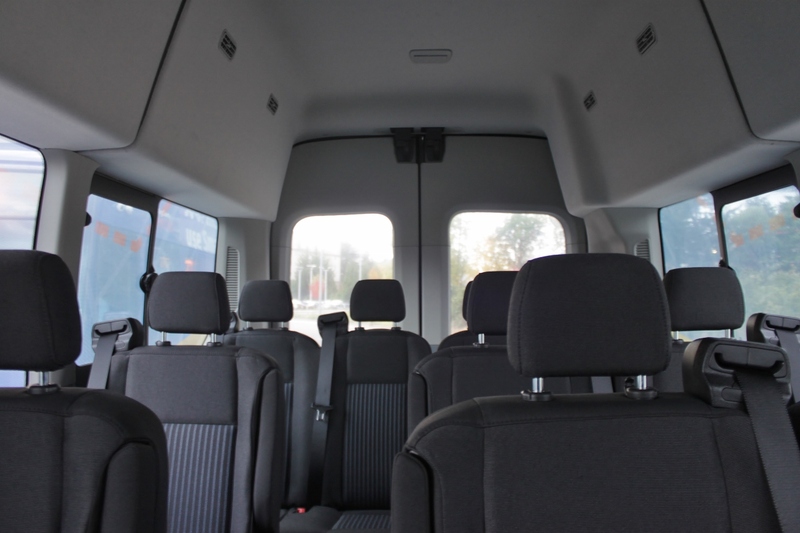 Equip all vans with powered doors so the passengers don’t risk injury while boarding on a hill. Is this a trial for microtransit service near suburban Link stations? What existing and future stations would benefit from microtransit? Everywhere there’s single-family zoning.Somerset and Newport Hills (not included) are obvious places because they’re very difficult to serve by fixed-route transit, and even if you have a bus on the main street that’s still a long walk from many houses. I lived on Somerset for several months in high school and there were two routes, the 210 (Seattle) in the middle of the hill and a ten-minute walk away but it ran only every 90-120 minutes, and the 252 (U-District) at the bottom of the hill a half-hour walk away. Later Metro tried a daytime route throughout the hill but it failed due to low ridership. A demand-response van in a limited service area that can go directly to people’s houses is a good fit for the area. The limited area means it’s never very far from the next person who summons it, the trickle of riders means that people will rarely have to wait a long time for others, and when there’s no demand it can remain parked and save gas. The limited service area also means people won’t abuse it to drive to areas where there’s a parallel bus. So I would nominate Somerset and Newport Hills first, and that transit hole at 123rd Ave SW where Metro wants to run a coverage route in 2040, and the area around West Lake Sammamish Parkway, and maybe Beaus Arts/Enatai, and Mercer island. The Eatgate P&R is one anchor, and Bellevue Transit Center should be another anchor, especially north of I-90, and perhaps south of it, at least until Issaquah Link is built or a frequent Eastgate-Bellevue bus route exists. The distance between Eastgate P&R and Bellevue TC is so short that it seems borderline gratuitous to take somebody from Somerset to a freeway P&R and dump them there when it’s so close-but-not-close-enough to downtown Bellevue. It looks like this person used the Ride2 to get picked up and dropped off along the route 226 line. Picked up at Lake Hills Blvd/156th ave and dropped off at the Eastgate P&R? That’s exactly where the 226 goes. If this service is going to be used by people along bus routes who just don’t feel like taking the bus for whatever reason, then I think it should be cancelled. It’s wasteful and it’s a duplication of service. Seriously though, I think the author was just trying it out. But this just shows one of the problems with microtransit. It is pretty easy to designate a big region and tell folks they have to call a van (since there are buses in the area). It is quite another to overlap with bus routes. Then you may be cannibalizing existing bus service, or have to create a weird coverage map (with the bus routes essentially hollowed out). I’d like to at least ride that van it once, so I can do the driver a favor and improve his vision by taking a paint scraper to all his windows. But here’s my plan for company we really need. Because respecting passenger in The Big Organic Apple would ride in anything named Minny? So here’s my real Vision. By now, Seattle has a lot of newly arrived residents who’ve still got some lingering nostalgia for New York City. So lwe re-start with a fleetful of these, last built in 1982. 36 years in a wrecking yard will have restored their historically accurate ambience, and testify to the fact that the car can roll over a landmine like it was a shallow pothole. One serious Inaccuracy in the picture is that all the fenders look like they came with the car same car. Routinely necessary replacement like faster than changing a tire. Terrific handling, and passengers didn’t have to be a featherweight wrestler to get in. Easy on gas for something that size. Chevy Six if memory serves. Different upholstery than standard, but little swivel seats were real, Great for our 60′ artic trolleybuses, doncha think? “On The Town”. Betty Garrett mostly realistic. Accent perfect, though uniform lacked bomber jacket with patches from her boyfriend’s Army Air Force wardrobe. But even more important, since she also lived in Seattle, i it proves local drovers can talk like her as the work requires. Do you really think Brunhild Esterhazy (Hungarian American)- we all had to have our own pics visible on the window visors- would’ve picked you up on a bet whether you were Frank Sinatra, Gene Kelly, or the kid next to Admiral Halsey? Ross, funny comment. But, one thing that I think needs to be evaluated down the road is what percentage of Ride2 rides closely duplicate existing bus routes? Or, are the majority of riders legitimately taking it because their home isn’t near regular Metro bus service? Excellent questions, Sam. I’m looking forward to your investigative reporting. Any chance that standard taxicabs might work better for this service than the vans? Highly recommend Orange Cabs. Bruce made an artificial trip to test the system as a news reporter. As a non-resident, he probably doesn’t know all the areas that residents would go to, and if he takes it to some obscure location with only houses, he’d be stuck in the middle of nowhere and have to call for it to take him back. But a resident would go to/from that obscure area because they’re going home or to the person they’re visiting. As Mike said, this was merely a test run to an area I know (and would not get lost trying to navigate back from). As a bonus, it also helped avoid riding through the college campus, which has several speed bumps that buses can have a hard time maneuvering over without jostling passengers. Since this is a proof-of-concept service at the moment, I think there’s a good chance it can be expanded to all-day and all-weekend service eventually. Ride2 is a excellent way on the weekends for communities that are cut-off from transit, like Somerset, whose only bus service (route 246) doesn’t run on the weekends, to get to a transit hub like the Eastgate P&R. What’s that you say? Ride2 doesn’t run on the weekends, either? nm. This seems like a type of system that works great when you’re the only one using it. Though, when your trip from Eastgate P&R to Lake Hills library ends up stopping at some random house in Somerset along the way, you might have different opinions. It doesn’t take very many users at all to make the microtransit van slower than just waiting for the 226. I do have the same fears, but there shouldn’t be massive detours with a large enough fleet, especially on trips originating from Eastgate where things can be easily sorted out by the trip scheduling algorithm. But what happens when there are a lot of people and the algorithm goes to work? Sure, it figures out what’s most efficient in the situation, but that doesn’t make it objectively efficient. The service will meander, and it will be unattractive, because service that meanders is unattractive. We know this from our experience with fixed-route service. In these busy times, when microtransit adopts the worst characteristics of fixed-route service, is it really any surprise that it fails (which it has done all over the country)? There’s been some preliminary discussion of this at my workplace. One thing that was proposed was service from SLU to King Street Station or Ballard, which makes no sense to me when there’s obviously a need for existing bus service (or CCC) to be improved. However another option was for taking people to outlying P&Rs. I’m interested in trying that, depending on the pricing model, since my bus ride to the future light rail stations at Roosevelt or Northgate both involve transfers (and that probably won’t change). I’m open-minded about whether this kind of service will encourage a weird bus network. I think it’s also possible that it would provide more flexibility to say “we’re going to space out the stops and align them in a grid” and the inevitable stop or route closures can be mitigated by this kind of service. From the initial ridership numbers I’ve seen, though it seems right to be skeptical. SLU to Ballard would make a lot of sense, right now that trip requires riding two buses that meander through downtown instead of one that can make a direct trip. We’ve discussed “jitney” service before. Van or taxicab sized vehicle able to vary one side or another from a main arterial. Since this photo shows an actual jitney, as it says on the windshield, stopped same place as a streetcar, it proves that LINK stations might need to be designed so train and jitney both stop on same cobblestone street. Add some milk cans if county grange statutes insist. extrapolating from the Route 226 timetable, the running times were similar. what is the wait time for a pick up? how does it compare to the average wait time of the fixed route service? suppose there was a second passenger; would the routing have a deviation to serve their destination first? does the service scale well? there are areas without fixed route service, but this is not one of them. who covers the cost? for what else could the public funds be used and how many benefits would that have?